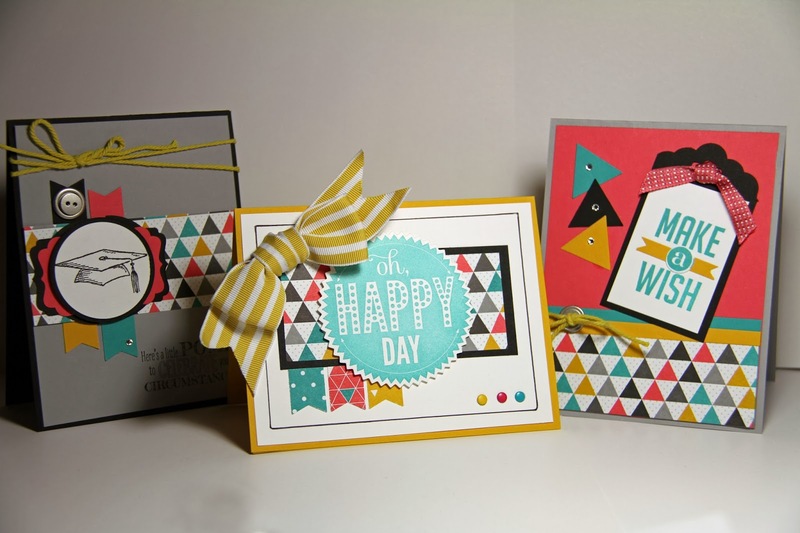 Three ideas all using Kaleidoscope Designer Series Paper. Click for larger image. The Occasions Catalog that went live earlier this month, includes the Pomp & Circumstances set used on the first card below. 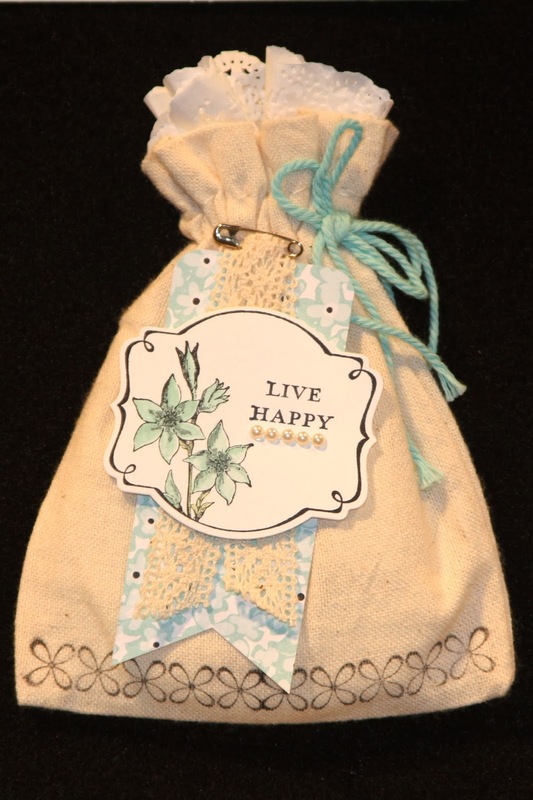 The twine is part of one of the Sale-A-Bration Accessories kit you can get free with $50 (excluding tax and shipping) purchase next week Tuesday when Sale-A-Bration kicks off. My niece graduates next month and I'm ready with a modern, hip card that I know she will enjoy. Accessories: Starburst Framelit Dies (132967), Big Shot Die Cut Machine and cutting Pads, Circles Collection Framelits, Candy Dots Brad Bases (132293), 1-1/4" Striped Summer Starfruit Grosgrain ribbon (132981), glue dots. Tip: when adding a heavy ribbon to a card, I'll use several glue dots and then heat them with my heating tool. The glue dots hold more like hot glue and I don't worry about the ribbons falling off. The Kaleidoscope Designer Series Paper (132995) includes 12 different paper designs so you'll have lots more to select from when making your geometric projects. Get ready for some really cute projects made with new items Stampin' Up! will be introducing next week as part of Sale-A-Bration. A few of the new items are shown in this project. The new You're Lovely Stamp set, the Sweet Sorbet Designer series Paper and Pool Party twine from the Sweet Sorbet Accessory pack. All are different free gifts you can choose from with your $50 purchase during Sale-A-Bration. If you're a newbie to stamping, Sale-A-Bration works like this. For every $50 you spend (excluding shipping and tax), you receive a pick of a free gift from the Sale-A-Bration flyer. There's lots to choose from. The products are exclusive -- the only way you can get them is with each of your $50 purchases from the main catalog or the Occasions catalog between Jan 28 - Mar 31. If you've been holding off on placing your order from the Occasions catalog, next week Tuesday is the day to place your order to take advantage of Free picks. The on-line ordering system reminds you to select your free gifts before you check out. Visit my blog on Tuesday to download a copy of the Sale-A-Bration flyer to see which Free gifts you'll choose. Just a few more weeks to get the free markers when you sign up for Paper Pumpkin. And you're in for great surprise if you're already one of my Paper Pumpkin subscribers. The new monthly kits now include more product for the same price! Details: NEW Paper Pumpkin subscribers who sign up at My Paper Pumpkin before February 10, 2014, will receive a FREE set of 2012-2014 In Color Stampin' Write Markers -a $14.95 value. And the Feb and March kits are fabulous! We we're given a "behind the curtains" preview of the next two kits--Feb and March--, I must say that I was very impressed with how much you'll get in these kits! The video below show what the January 2014 Paper Pumpkin Kit looked like. You can see all of the products unwrapped as part of the kit. These kits are great for new stampers who want to try stamping, but don't want to make a big investment in stamping supplier. Each monthly kit include what you need to make the cards plus instructions...or use your creativity to come up with your own designs. Sign up with your BFF, mother or sister and get together for an afternoon of chatting and crafting with your kits. This also makes a great gift for someone in a nursing home who is still active, but doesn't have space for a full craft room. Once a month you'll have a special surprise when you visit. Give her an extra kit or bring your own so she'll have someone to stamp with. It is a great social activity for any age. Watch this video to see what was in the January 2014 Paper Pumpkin kit. I got a sneak peek at the February and March kits and ABSOLUTELY loved how much product was in each of them. More products; and great value for the stamper who wants to do different projects each month, but doesn't want to invest in a lot of suppliers. The markers will be sent with your Welcome Kit. No coupon code is required. Anyone who signs up for a Paper Pumpkin membership during the promotion dates will receive a set of 2012-2014 In Color Stampin' Write Markers. Prepare your Valentines early - Hurry, the products are gone 27-Jan-2014! Order a 2013-2014 Annual catalog or Occasions catalog - now available! !